Chop up onion, fresh cilantro, and garlic cloves. Add all of these ingredients to a bowl along with ground white turkey meat. Mix together then add egg, cumin, salt & pepper. Make sure all ingredients are thoroughly combined. Form 1/4lb. burger and set aside. Turn the grill on to medium high heat. Season red peppers and poblano peppers with olive oil, salt & pepper. Place them on the grill. Once burgers are done, set aside. Alright, time to put this bad boy together! 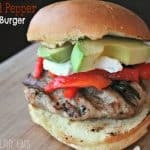 Bring out your buns (I toast mine because I like them warm and crunchy), next your turkey burger, then add a little bit of your red peppers and poblanos. Thats the main part of the burger, for additional toppings I added 1 slice of goat cheese and sliced avocado. YUM!! !